(Birdsfoot Trefoil (Lotus corniculatus) - 01) Birdsfoot trefoil produces clusters of yellow flowers from June to September. 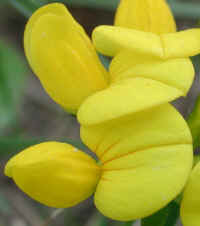 According to the literature, the height of the birdsfoot trefoil ranges from 6 to 24 inches. We have found that it easily adapts to roadside cutting and will produce flower clusters only 2 inches high. To us, this is all part of God's way of preserving His creation. (Birdsfoot Trefoil (Lotus corniculatus) - 03) We can observe the relative size of the birdsfoot trefoil in comparison to the blades of grass growing in their midst. Just to the left of the center of the photo, we can see a cluster of buds, and just below them, the beginnings of buds. 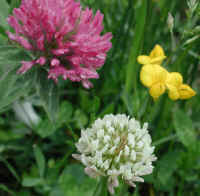 These wildflowers can generally be found north of a line from Virginia to Ohio. (Birdsfoot Trefoil (Lotus corniculatus) - 04) This photo of the birdsfoot trefoil gives us a good view of the 3-fingered end segment of the leaf structure. 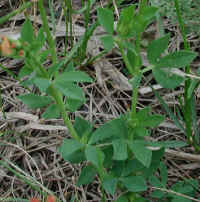 (Birdsfoot Trefoil (Lotus corniculatus) - 05) In this photo we see birdsfoot trefoil growing with red and white clover - a living bouquet of God's creation.